Here is the metering block that I used. Both have the same part numbers. Here is the location of the IJ or (idle jet). One at all 4 corners like this. Here is an E hole or (emulsion hole) and it is .028 in diameter at the bottom and is open. Here is another E hole and it too is .028 and open. Here is the location of the crosswell or angle channel. This is what gets drilled out to .159. Mine were .145 OD and I didn't drill them yet. I wanted to wait to see if there was a fuel problem down track and I'll find that out with the O2 sensor this spring. The plug read that I did last fall didn't show a lean condition and was actually a little fat so I may be OK at that. Here is what is known as the "kill bleed" and you will need one in each crosswell on the primary block only, but, if the secondary has'em that's OK too. You just don't need to add them if they aren't in the secondary block. This is the PVCR or (power valve channel restrictor) and it opens into the mainwell just above the main jet. Two holes there, one on each side and don't worry about the secondary block on these as there is NO PV in the secondary. This is the location of the TSJ or (T slot jet) and there will be 4 of those as well. Just remember that the one on the other side will be a mirror image of this one, ie, both TSJs will be toward the center of the carb. 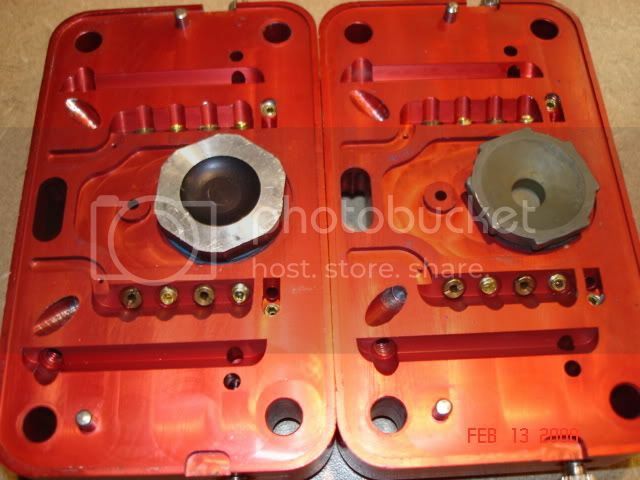 Hope this helps for those of you that will be using a standard 4150 Holley metering block. Very good decription and pictures Ken. Just remember to tap a little, then check the installed depth, most of these jets will cause a problem if they are installed to deep, aim for flush, and I think it's worth the extra time and effort to have them matched up as far as installed depth. Ended up using a small punch to stake the 3rd thread from the top on those 6-32 set screws in order to keep them from going too deep into the main well. The information age is hard on the carb builders now that so many people have access to their AFR with the WBO2’s. I just ordered and received some blank 6-32 bleeds from QFT. These are the ones with the head that look like small air bleeds. If you need them fast, let me know. I think I have 4 pairs. My carb should be shipping back today or tomorrow so I can have them throw in some extras if we need more. Let me know. Phone number on PM. How is everyone drilling these set screws? Pin vise or drill? I'm asking because it's taking forever to do with a pin vise. If it matters I'm using brass set screws with a cupped end. That sounds like the plan. I'll try that. 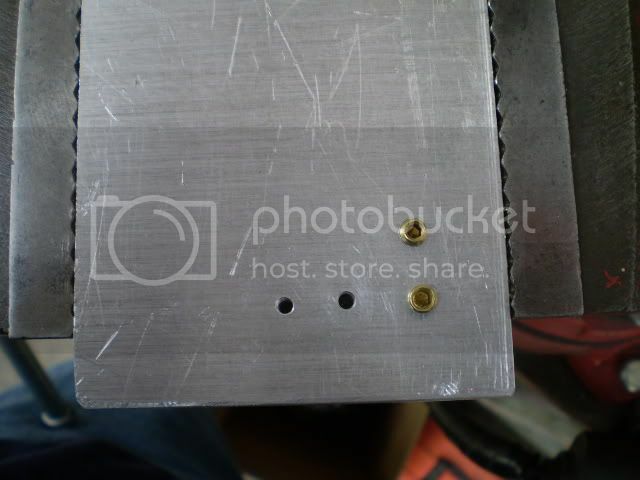 I place the set screw itself in the drill chuck and use the pin vise to hold the bit. I tried it that way and broke drill bits. I did make a block to hold the set screws. I got the same result Scott did. Chucking them in a drill got good results. One thing I noticed. I had some blank bleeds I got with my latest ProSystems carb and drilled them. They must be of a softer brass than the set screws because they drilled a lot easier than the set screws did. Because I already have a 2circuit dominator and if I`m reading this right, I just need to install the tsj the idj and drill out the angle channel to make it work better/right. What size jet and ab`s should I start with in a 1050 without pv`s?